This technology enables the preparation, incubation, and analysis of water samples in the field without the need for any ancillary equipment. 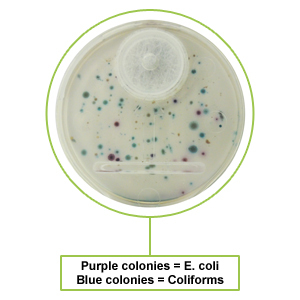 With simple visual examination (the most trusted and accepted method of enumeration), unskilled users can successfully conduct E. Coli/Total Coliform water tests outside the laboratory with quantitative results in as little as 12 hours. 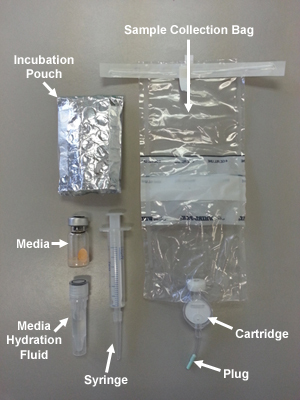 Test kit includes: Sample collection bag, filter assay cartridge, dehydrated media, media-hydration water, syringe, and incubation pouch. Enables users to: filter water sample, capture organisms, administer media or reagents, incubate, and analyze outgrowth- all without opening the cartridge or exposing it to the external environment/contamination. No need to transfer sample from filtration unit to another vessel for culture. No electricity required. No sophisticated interpretation of results. No technical skill/training necessary. Express water sample through the cartridge via hand pressure (squeezing the bag). Visual examination of the cartridge offers quantitative results / colony counts. Self-contained filter membrane never leaves the enclosed cartridge thereby minimizing any risk of contamination. Air vent in the cartridge is protected by microbial-barrier layer which keeps out airborne contaminants. Compatible with variable size filter assay membranes (47mm, 35mm, 25mm, 16mm). Sample volumes of 10mL to 100mL+ (dependent on water-sample bag size). Reduce sample preparation time and volume of assay material to be shipped, stored, and decontaminated/disposed. testing after initial culture (colony recovery). Method is consistent with regulated procedures for membrane filtration. See colonies in 12-18 hours with enumeration & identification of colony growth. The invention relates to a device and method for preparing and testing a fluid sample using a filtration procedure for analysis of a filterable constituent of the fluid. In particular the process employs an enclosed pathway whereby the fluid sample is initially put into a sealable flexible containment-vessel, then it is passed through a fluid passageway to a removable enclosable filter cartridge, wherein the filterable constituent is removed and the resultant filtrate fluid is discharged from the cartridge. Once introduced to the flexible vessel, the enclosed pathway system thereby enables the fluid to be filtered and the filterable constituent examined with minimal complications of contamination of the sample through exposure to environmental pollutant external to the fluid sample.